It is still a bit early to be starting tomatoes but I thought it would be worth sowing a few to get some extra early fruit. Also I am keen to see how they do in Air-Pot containers from the outset. Plants which spend their first weeks in small Air-Pot containers don’t develop the root deformities which are inevitable in standard pots, meaning they should get the best start in life. I got great germination and have about thirty plants in a small propagation tray as well as eight in a 1 litre propagation pot. I find a really hot cupboard or propagator gets tomato seed growing in five days, then of course they immediately need good light. It will be two months before it is warm enough for tomatoes to be set out in my greenhouse. It may be necessary to plant them in their final pots sooner and give them some protection on cold nights. 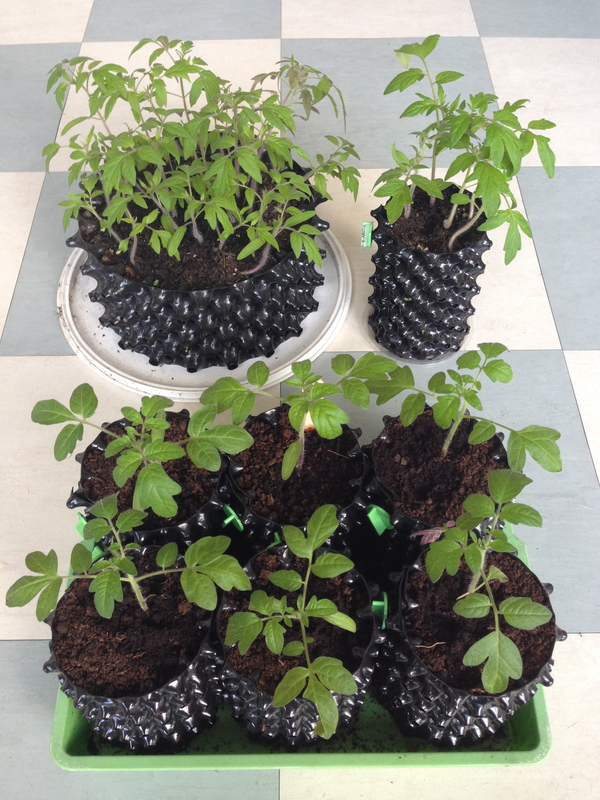 The Air-Pot will keep the young plants in good condition, ready to grow on when they get the chance. Have you any plans to develop an air-pot hanging basket? I’m planning to grow cascading tomatoes in hanging baskets this year but it sounds like an air-pot version would be even better. No Air-Pot hanging basket is planned but a medium or large pot from the garden range would be perfect for bush tomatoes. I am growing Maskotka which is a sweet bush cherry type with a tumbling habit, it is very early and continues cropping into the Autumn. Container growing lifts the somewhat unruly growth off the ground and helps keep the fruit clean, I may raise them up on some type of pedestal such as an old chimney pot. Or even experiment with hanging the Air-Pots? It should be easy enough to thread strong cord through the holes to string it up.